Just over a month ago I had the pleasure of attending a lunch hosted by Mark Slater of Slater Investments Ltd at the Royal Exchange. The purpose of the lunch was for Mark to give an overview on the performance of two of his funds (MFM Slater Growth & MFM Slater Income), plus he highlighted some recent sales and acquisitions that the funds had made. Mark obviously has investment in the blood, being the son of the venerable investor and financial author Jim Slater. His share picking strategy seems to stem closely from the methodology prescribed in his father's books, the growth fund certainly concentrating on smaller businesses with good growth potential as screened by the PEG ratio amongst other measures. I have been following the growth fund for some time and over the past five years it has risen by a spectacular 272%. It must be said that smaller companies have had a great run of late, and if there is a pull back in the market, smaller company funds could be hit the hardest. Nevertheless Mark has proven adept at dealing with downturns (see table below), hence MFM Slater Growth should be a decent investment for the long run. The MFM Slater Income fund has only been running since 19th Sept 2011 but performance so far has also been good; another fund I'll be keeping a close eye on. If you can't make out the small print it basically documents the percentage of months a manger has outperformed the market during downturn periods. Many of those in the list manage income funds, which you would expect to perform better during a downturn. 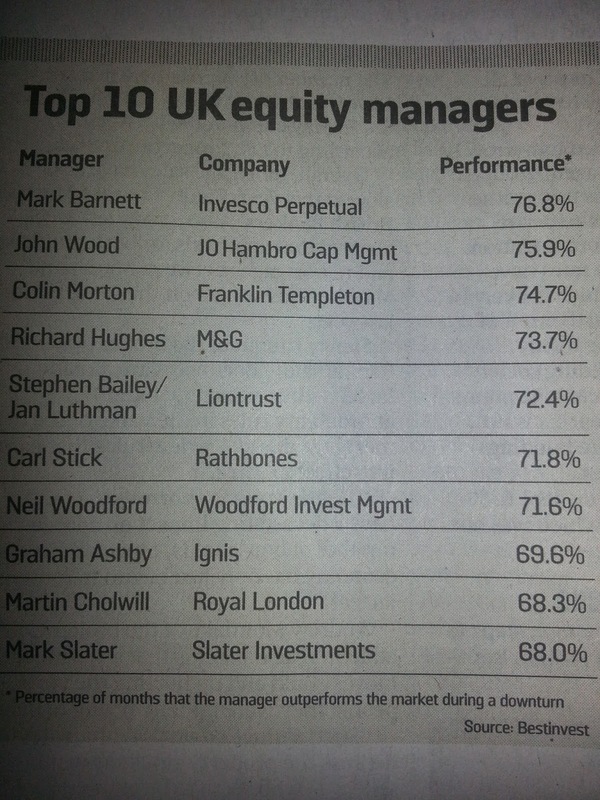 But as Mark is more geared towards smaller growth companies I think he's done well to make this list. NB. For anyone wondering if they should ditch the Invesco High Income fund now that Neil Woodford has left to set up his own venture, it would appear Mark Barnett looks a good replacement, on this measurement at least. I was unaware with the fact that the growth fund for some time and over the past five years it has risen by a spectacular 272% , by Epic research.